Signs That Should I Have My Tile Roof Color Coated? Living in the Southern California area, every home or property owner knows the importance of having a well maintained tile roof. In Southern California, the weather can beat down the roof with extreme prejudice. On any home or commercial property, the roof can be quite expensive to repair or replace. Sometimes though with a tile roof, it might just happen that the color has faded and needs to be re-coated. When there is wear and tear on a roof, it is not only noticed from the outside (neighbors, visitors, clients, etc.) but even by those who inhabit the home or work in the commercial property. For a commercial property this can give off the wrong statement to potential clients who might think you are not taking care of the tiles. As for a home owner and likewise for the property owner, having a tile roof that isn’t properly coated can make the living conditions somewhat unbearable. As you can see from the infographic, those buildings and structures without a cool roof coating exhibit a sharper increase in temperature and that can make things inside quite uncomfortable over long periods of time. Not only does it affect your well-being, but then it can cost you money in your bank as well. When you try to cool your home or building with air conditioning, fans and the like, it will take more energy to power those for extended periods of time. The energy cost will rise the higher the temperatures become outside and on the roof. Consult with the tile roof professionals at Custom Coating Restorations. 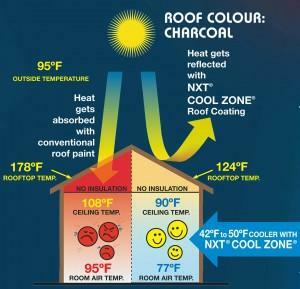 One of the perfect solutions to a roof that isn’t coated or has lost its coating is the NXT – Cool Coat. “Cool Roofs” coated with Nutech Paint’s NXT Cool Coat coatings will reflect the sun’s rays and keep the heat away from the inside. On the average, your home or property’s tile roof will keep cooler by up to 86° F. This means that the inside of your home will be kept a comfortable and cooler than the temperatures outside. Not to mention Cool Roof Coatings help resist moss, and have many different colors to choose from that will showcase the top of your building or home. For more information and to have your roof consulted, contact the experts at Custom Coating Restorations today!